In Alaska, North America there is one place you must visit, namely Denali National Park. 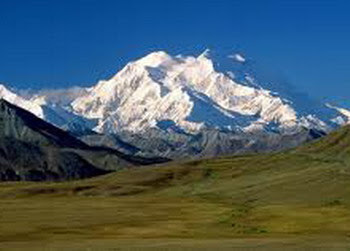 Denali or Mount McKinley has a beautiful long way 92 miles (148 kilometers)which leads to the top. From here, you can see the great valley and the hills of the iceberg McKinley. Many of them that came, chose to climb the iceberg McKinley, known as North America's highest peak. Denali is home to a variety of Alaskan birds and mammals, including a healthy population of grizzly bears and black bears. Although there are many animals in the area of ​​Denali National Park, but the most commonly seen are deer, caribou (bull mosse), dall sheep (sheep arrowroot), wolves and grizzly bears. Another great feature that you can get from this park is a light aurora borealis. Beautiful panorama of light will usually be often seen in the Chugach Mountains (south park) in the winter. Denali habitat is a mix of forest at the lowest elevations, including deciduous taiga. The preserve is also home to tundra at middle elevations, and glaciers, rock, and snow at the highest elevations. The longest glacier is the Kahiltna Glacier. In order not too tired, at the entrance of the park is provided transportation namely Alaska Railroad train that runs from Anchorage to Fairbanks and stop at every railroad station in Denali. Denali National Park can also accessible by car. The Denali Park Road is 90 miles long and accessible by private vehicle for only the first 14 miles to the Savage River Bridge. Denali National Park offers a wide variety of exciting ways to explore its unique environment. There are also a wide variety of ranger-naturalist programs offered throughout the summer, as well as some great day hikes near the park entrance area. Weather in Denali is extremely variable, and changes occur without warning. Many rangers tell visitors to expect sun, wind, rain, and clouds, and expect them all on the same day. Average summer temperatures range from 33-75°F (1-24°C). It has been known to snow in July, so prepare by wearing layers of clothing that can be removed or added as needed, and carry a waterproof raincoat or jacket. Winters can be extremely cold with temperatures ranging from -40°F (-40°C) and below to high 20s (-2°C) on warm days. Specialized cold weather gear is necessary for mountaineering and winter visits.